A photographer from Finland has stumbled upon an interesting junction between the worlds of art and biology. By placing saliva on undeveloped photographic paper, Erno Erik Raitanen was able to grow bacterial cultures on the paper while it developed. The resulting images, dubbed “bacteriograms” are surprisingly colorful and artistic. They almost look like something captured by an electron microscope, except with vibrant color. 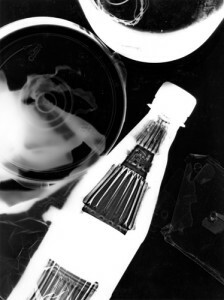 Photograms (sometimes called cameraless photography) are made by placing objects on light-sensitive materials and then exposing them to light. The microbes in Raitanen’s saliva affect the photographic paper on which they were placed through their normal growth and biological processes. They eat away the coating on the photographic paper, creating the colorful effect. If not stopped, the microbes continue growing on the paper. Raitanen has tried to remove all the bacteria from some of the images he feels are complete, but continues to find new cultures growing on them occasionally. This is interesting, but a little gross. Thank you for the information.